One doesn’t normally associate Donizetti with the Caribbean, but other opera composers have chosen exotic locations – Egypt, Japan and Algiers, for example – so why not Donizetti? However, I feel sure it was not the exoticism which attracted James Conway, ETO’s General Director, to Il furioso all’isola di San Domingo so much as its musical riches; for this is vintage Donizetti with plenty of rattling good tunes, choruses and drama. The action takes place on the island of San Domingo – now shared by Haiti and the Dominican Republic – and centres on a Spanish nobleman, Cardenio, who after being driven insane by the infidelity of his wife Eleonora flees Europe to find isolation far away from home. Yet San Domingo is far from being a tropical paradise where one can drink cocktails from dawn to dusk; it is a Spanish colony bent on making a profit from its plantation by the merciless exploitation of its workforce – and having a maniac in their midst only reinforces the wretched lot of the plantation workers, especially the slave Kaidamà who is brutally attacked by him. The story is from Cervantes and is also believed to be the inspiration for one of Shakespeare’s “lost” plays; one suspects he recycled some of the material in The Tempest. A tempest and a shipwreck feature in this opera, one of the victims being Cardenio’s estranged wife Eleonora who is cast ashore after her long quest to find him. (Her tattered skirt which exposes the hoops sustaining it is surely a warning to ladies to equip themselves with sensible clothes before embarking on a voyage!) Later Cardenio’s brother Fernando turns up as well having been entreated by their mother to effect a reconciliation with Cardenio. Fernando had been the cause of Eleonora’s infidelity, and his appearance by her side in front of Cardenio’s does nothing to heal the latter’s emotional scars; on the contrary it serves only to revive Cardenio’s murderous maniacal tendencies. Later Cardenio is struck blind and Eleonora seems to be making progress in renewing their love, but when his sight miraculously returns the mere glimpse of his brother is enough to make him dash off into the sea to drown himself. Fernando plunges in after him – the slave Kaidamà gives a vivid blow by blow account of the rescue – and when Cardenio tosses off his rags and starts dressing like a European nobleman again, normality seems to have been restored. But not quite: the next stage in this saga is his decision to make a suicide pact with Eleanora (“He deciso e secco spento”) which will reunite them in death – a sort of pre-Wagnerian Liebestod. I hope I am not giving too much away when I assure you that in spite of everything the opera has a happy dénouement with the European contingent taking leave of the island for Europe to the accompaniment of flag-waving by the locals. My brief account of the plot may suggest this is a story of self-obsessed Europeans washing their dirty emotional linen in front of the natives, though I doubt whether 19th century audiences would have viewed it in that way. The difference is that nowadays we tend to sympathise with the underdog – in this case the slave Kaidamà – who, far from being an object of fun, is an outsider offering a suitably jaundiced commentary on the shenanigans of the Europeans. The Europeans may be slaves to their own passions, but in Iqbal Khan’s production the plantation workers are just slaves, and have no choice in the matter, making this is a far more thought provoking opera than one generally associates with Donizetti. The production was enhanced by Florence de Maré’s intriguing set, apparently inspired by the ship-breaking yards of Bangladesh. In the overture one has the impression of a massive wave surging out of an ever changing seascape. It later reveals itself to be the battered hull of a wrecked ship which is progressively dismantled in the second act. Credit is also due to the atmospheric and continually changing lighting effects designed by Mark Howland. Emma Watkinson, deputising for Donna Bateman in the role of Bartoleneo’s daughter Marcella started off the opera very creditably with the aria “Frema il mar lontan lontano” and grew into her sympathetic role as the opera progressed. Her dad, played by the normally very personable Njabulo Madlala, was something of a cold fish, a stickler for law and order with his whip always at his side; but his rich bass-baritone voice was, as always, a delight to listen to. I couldn’t help feeling that the two brothers were miscast, with the one several decades older than the other. Craig Smith’s Wild Man came over as a senile crackpot; he may have inspired terror in Kaidamà and the plantation workers but he didn’t have this effect on me, and somehow his plaintive life story and memory of past nuptial happiness, “Era il sorrio gioni miei” did not really engage my sympathy. Fernando, played by Nicholas Sharratt, struck me as rather characterless, going through the motions of reconciliation rather than putting his heart into it. Yet, as we hear from Kaidamà’s (possibly embellished) account. he shows considerable courage in rescuing Cardenio from the ocean’s deeps. Once she had got over her shipwreck Sally Silver dominated the stage as Eleanora and her powerful diva voice gave plenty of momentum to the closing scenes of the opera. However, to my mind the star of the show was Peter Brathwaite as the much put upon Kaidamà, the one person who doesn’t take himself too seriously. (When you’re at the bottom of the heap, you don’t have that privilege!) He enlivened every scene he appeared in – and fortunately there were plenty of these . Whether describing his escapades with relish or attempting to detach himself from the deranged Cardenio’s amorous gropings his singing and acting were funny and engaging. He is surely a natural for the role of Leporello? Jeremy Silver and his musicians kept up the impetus of the plot and there was good lusty singing from the men’s chorus who despite their shabby clothes looked fit, well fed and not particularly down trodden. Earlier in the day I had heard two of them plus an understudy from La Bohème in a recital – an excellent way to offer up-and-coming talents professional exposure. Tenor Ronan Busfield performed Donizetti and Puccini with passion but Rossini’s devilishly complicated “Si, ritrovario io giuro” made excessive demands on his voice. Susanna Fairbairn proved equally accomplished in the roles of Mimi and Musetta, so ETO need not panic if one of its principals in La Bohème calls in sick. The audience were especially impressed by baritone Gareth Brynmor John’s whose singing of arias and songs by Tchaikovsky and Rachmaninov were seemingly effortless; the warmth of expression he brought to Wagner’s “O du, mein holder Abendstern” was out of this world. 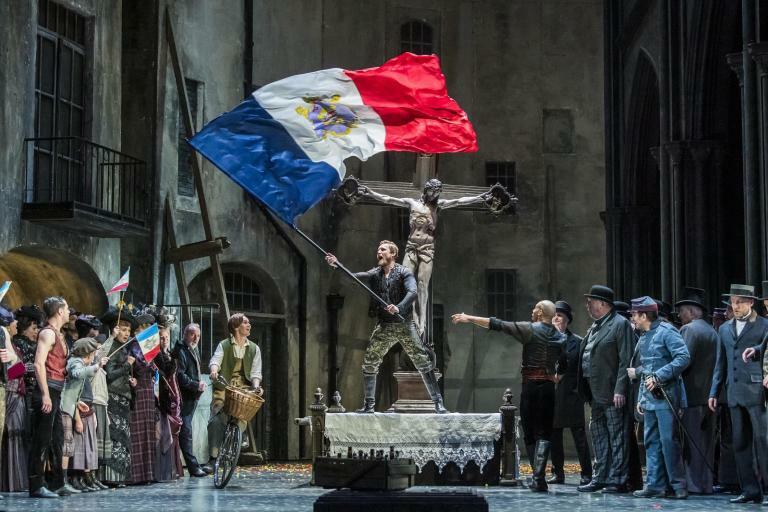 English Touring Opera’s tour, which also includes the operas La Bohème and The Siege of Calais, moves on to Wolverhampton, Aldeburgh *, Leicester *, Warwick Arts Centre *, Exeter *; (May) Crawley, Canterbury, Blackpool, Buxton *, Durham, Perth and Cambridge *. (* indicates that The Wild Man of the West Indies will be performed at this venue). This Donizetti rarity is well worth seeing, but I suggest for the next tour it should be renamed Kaidamà! For further details please see www.englishtouringopera.org.uk.